Ernesto Vilchis shows off his tongue, tripe and cow's cheek tacos. One of the cooks in Tacos Sinaloa's seafood truck waits to take orders. Gavin Ames finishes up his meal. 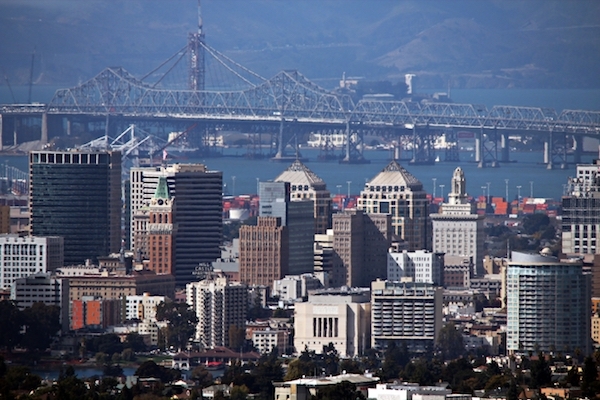 Connect with Oakland North on Facebook, or follow us on Twitter. Facebook fans voted for us to cover Tacos Sinaloa as their most recommended Oakland food truck. Read other stories in our food truck series: Jon’s Street Eats, CupKates, and Seoul on Wheels. Owner of Tacos Sinaloa, Lupe Bueno, stands in front of his taco truck in East Oakland. Ernesto Vilchis shows off his tongue, tripe and cow’s cheek tacos. One of the cooks in Tacos Sinaloa’s seafood truck waits to take orders. A family favorite for us. My friends have been making the 40 mile drive from east CoCoCounty for late night burritos, tacos and oysters for years on end. When friends fly in from the South, this is the first place we take them. Can’t say enough about this place. Hit it up at midnight on Friday night for some tacos de pescado, so good. Tacos Sinaloa is THE JUNK. Please please please put a truck in Berkeley. Downtown, if they’ll let you. It’s too far to drive to Intl Blvd at lunch. just went the other nite, had been awhile. after chowing down, i wondered why i stayed away so long. hands down the best taco in Oakland, and at a buck 25 a pop, what else is there to say..just go!